What is the best rat poison? We advise you to opt for slow-acting baits. They are safer to humans and pets as they require multiple feedings to kill. Rats will not associate the object with the poison effect and will not shy away from getting close to the trap. We recommend using a slow-acting Tomcat All Weather Bait Chunx. Why have we chosen it? The product contains the active ingredient Diphacinone that is more toxic to rats than other slow-acting compounds. Still, it requires multiple dose treatment. As a rule, the solution works within a week. The product comes in convenient blocks and is flavored with peanut to attract rodents. There are two types of rat baits: Non-toxic (natural) — to lure rats into traps and Rodenticide poison baits — to kill rodents. Here you'll find 5 best rat and mouse poisons from $11 to $65. After eating rodents die within from several hours to several weeks: mice may die within a day. But the population of rats die more slowly, within a week or two, because they are larger than mice. Remember — poison baits are toxic and can kill any animal including your home pets (cats and dogs). What to look for when buying? All of poison baits are lethal. Rodenticides are toxic to rodents (and unfortunately also to humans) in a variety of ways. Active ingredients in rodenticides that are anticoagulants (e.g., warfarin, diphacinone, and bromadiolone) disrupt the blood's ability to clot, causing internal bleeding and rodents die from internal hemorrhages. Products containing non-anticoagulant affect the nervous system (e.g., bromethalin). They increase the levels of calcium in the blood, leading to kidney, liver, or heart failure (e.g., cholecalciferol). First generation — poison kills rodents slowly, there are several days of feeding needed. Warfarin, chlorophacinone, and diphacinone are known as multiple-dose anticoagulants. They have a cumulative effect, so the rodents do not die immediately, rather within a few days. For best results, rats should eat the poisonous bait repeatedly. Second generation — a single feeding is enough (bromadiolone, brodifacoum). Using poison bait is generally cheaper than trapping because it is less labor-intensive, and they do not need to be checked every day. So it’s more beneficial to use poison bait in big areas and constructions – such as hangers, sheds etc., where other methods are inconvenient to use. In territories where water is in limited supply, a liquid rat poison works great. For example, you can buy Tomcat Liquid Poison Bait. Slow and Fast Rat Poison: What’s the difference? As you may know, there are three types of rat poison: first-generation anticoagulant, second-generation anticoagulant, and non-anticoagulants. However, they can be further divided into two categories: fast and slow poison. The table below further explains the difference between them, their pros&cons. Because it requires multiple feeding, the poison is safer for everyone in the household: your pets and your children, even if exposed to poison, will be most likely safe, or at least you’ll have plenty of time to save them. Because 1st generation (slow) poison has been around for a long time (the discovery of warfarin dates back to 1920s), rats have mutated and developed resistance to some substances (like warfarin) and are still developing resistance to the others. Requires a single feeding to become lethal. However, after exposure rats are dying within 4 days. Kills after a single dose. A rat will die within 2 days. 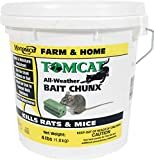 Tomcat All Weather Bait is easy to use and works against mice, rats, voles, chipmunks and other rodents that damage your life. Tomcat All Weather Bait is easy to use and works against mice, squirrels, voles, raccoons, chipmunks and other rodents that damage your life. We found out that this product is just like the rat poison bait that professional exterminators use, but some people think that the 4 lb. is plenty for non-commercial applications. The blocks of bait have holes to insert them onto the steel rods in a bait station, which keeps them away from other animals. You'd better use rat bait stations because we don't recommend to use Tomcat without one. A one-bait bucket lasts most in the summer and fall, and during winter it can last the whole season. Tomcat bait chunks work fast – a lot of people say that they began finding dead rats the next day or within the next week or two, it depends on the stage of rodent infestation in a house or attic. And, it's enough to deal with rodent problems for a very, very long time: "Once the immediate problem is resolved, I'll just leave the bait blocks in place and check them about once a month. If one is eaten, I'll replace it at once. No more rats!" Remember that rats can gather up the blocks and take them back to their nest, where they will die. So you might think that the bait doesn’t work, because you don’t see the rats’ corpses. Active ingredient: Diphacinone, each packet contains 1.5 oz. Rats love JT Eaton Bait – this is confirmed by customers. People are quietly leaving their homes, placing rat bait stations with this rat poison bait, and after return they find empty stations. It means that "someone" eats it! In addition, users use this lure to get rid of gophers and squirrels, too – but we recommend placing poison bait with a bait station. This is particularly important because some users complain that after just laying the bait out on the floor, mice ate it and left the harmful (brown) granules of the bait intact, and go away. Customers also noted that, JT begins to work very quickly – one girl said that rats in her house started to eat poison blocks on the first day after placing it at basement, and then they began to disappear gradually. If you want to break JT into pieces, it is easy to make. By the way, one guy gives a valuable tip to other customers about using JT: “Remember, the adult rats will feed something new to their young and watch to see how they react to it, before they will eat it themselves. Be patient”. More helpful tips you'll find here. The JT Eaton Bait Block rodenticide is a first generation anticoagulant bait. This rat poison comes as a solid one pound block, scored to easily break into eight 2 ounce pieces. In opinion of customers, rats really love to eat Just One Bite bait. Not only rats – this bar bait will also take care of mice, chipmunks and squirrels, too. Customers noted that this works great: One of them found a dead rat within 12 hours after he placed the bait. Customers advise to not lose heart if it doesn't seem to work. You might have to use a larger portion for pesky mice and rats, or use Farnam bait with a trap for better results – as one of the customers that used it as bait with a couple of old-school snap traps and an electronic mouse trap said it works like a charm for him. One of the customers said that he purchased this rat poison and left it in the bag in the room. Later he heard a rustling and other strange sounds. It turns out that the rodents found the package with the bait from the smell and badly gnawed the content! “I know you're supposed to position the poison in the critters pathway but my critter did it for me”, – he said. You'll probably have to get rid of dead rats from your basement and other places after their lethal feeding. In such a case, we also recommend purchasing one of those long claw grip things people use to pick up trash in order to remove dead rats – such as the Unger 36-Inch Pick-Up Tool. At first, it has rather a big enough: 40 twin packs (2 x 50 grams). This can be expensive for someone, but... As customers have noticed, it differentiates the more expensive poison bites from the budget ones: “The rodents are eating this product like mad and dying. As the ads say, it kills them and dehydrates them so there is no stink from their rotting carcasses”. They note that Havoc Bait works great on rats and mice – at any time of the year, even in winter, because of the all-weather formulation. This bait also works on moles, someone wrote: “I use this to help control moles and it works great if you know the tricks”. This is an old and proven killer of rats. This package contains one refillable corner fit bait station, 6 Bait Refills. Just place it in the approximate area where you saw the rodents. As customers noted, D-Con Rat & Mouse Bait works on mice and rats (especially on horrible “Norweigen Warf Rats”), squirrels and chipmunks. If you want to destroy rats to the bitter end, you need to keep giving them more poison bait until they all die. Normally the activity of the mice increases in early November – be ready! You can mix it with peanut butter. Users give a tip not to resort to other methods of getting rid of rats (exterminator’s ways or glue traps, for example) at the same time as using D-Con Ready Mix Killer, they can stunt the bait’s effectiveness. Kills rodents slowly, there are several days of feeding needed. A single feeding is enough. If you have a huge rat infestation, don’t want to get involved in a dirty job of dealing with them, and would like to be 100 sure in positive results - time to call the professionals! You should be aware that mice and rats can learn to identify and avoid toxic baits; this tendency is known as “bait shyness.” To avoid bait shyness, it may be necessary to prebait (offering rodents similar but nontoxic bait prior to applying the toxic bait) an area prior to using toxic baits, states Utah State University. If accidental exposure occurs, call 911 immediately. What are the right and most effective ways of using rat poison? Where to put it exactly? Whenever you see rats’ characteristic droppings of feces and urine, these are the exact places you need to put your poison baits. Train the rats to lean that the baits are safe to eat. Place the baits here and there whenever you see rodent activity but do not insert poison into them. Then after a short while, 2-3 days, place the baits with poison in the evening. Remove the leftovers in the morning. Follow the same routine for the next couple of days (place poisoned baits in the evening, clean after in the morning). That will ensure most of the rats are poisoned. Choose the approved rodenticide. If you want to check if the poison of your choice has been approved by the EPA, then check it in the Pesticide Product and LabelSystem. Poison Effectiveness: when poison is better than other pest control methods? Poison is never better than other pest control methods. It endangers biodiversity, put at risk your loved ones, and contaminates groundwater and soil. Some of the symptoms may take time to develop: from a few hours to a few days. Whenever you see your pet suffer the symptoms described above, call Animal Poison Control immediately. Unfortunately, there’s nothing you can do at home to help your pet. Your pet might require prolonged treatment with Vitamin K.
Call 911, Poison Control, or your doctor and receive first recommendations as to what you can take and do to help you deal with the first symptoms. Some of the meds the docs that advise you to take can be charcoal and syrup of ipecac. However, do not take any medication if not directed by professional. Charcoal may not work for some poisons or even make things worse. Vitamin K shots might be also necessary for full recovery. What precautions should I take when using rat poison? What to do when rats do not eat poison baits? Rats are picky and finicky. Thomas Pritchard, associate professor of neural and behavioral sciences at the Penn State College of Medicine, says that to avoid poisoning a rat "will nibble at the food and walk away". It wait for a day to see if the food makes her sick, and if it does, then the rat will avoid the same flavor, taste, and smell in the future. It means that when rats stop eating your poison baits or don’t touch them altogether, then they are already familiar with either the toxicity of the bait or its unpleasant flavor. So, what would you do? Change the bait as soon as you notice rat avoidance! Remove all potential sources of food so rats have no choice but to eat the bait. Use only tight-sealed metal containers to store garbage. How to safeguard my pets against poison? Use bait stations: This way, your pets won’t be able to access the poison. If my dog or cat eats a dead poisoned rat, will my pet die? Or does poison break down within the rat’s body? Yes, there’s a risk of secondary poisoning. So whenever you think your pet consumed a dead poisoned rodent, please, call Animal Poison Control immediately. Can I place a poisoned bait into a regular rat trap? Yes, you can, but we do not recommend doing it. Your dog can access the bait and die, your child can be exposed to the poison, and suffer as well. So please use special poison stations to ensure no one in your household gets hurt. What’s the difference between different colors of rat poison? There’s no color coding standard for rat poison, but generally, the color indicates the main ingredient in the poison. Which other pests can I kill using rat poison? You can kill any pests with rat poison. Anyone who consumes rat poison can die. Is rat poison a chemical hazard? Of course. That is why it’s called a pesticide, and controlled by the EPA. Yes, it is. But using rat poison to kill other animals is illegal. Poultry houses and livestock barns are very attractive for rats for reasons that they provide places to hide and nest, abundance of water and food. Rats will eat and contaminate poultry feed, cause multiple physical damage to building structures, equipment, and electrical wiring. 1. Prevention and sanitation: prevent rats from accessing the barns and poultry houses by sealing the cracks and holes shut. Employ good housekeeping practices: clean the barns and coops frequently and carefully, mow the grass and keep the trash away in the sealed metal containers, get rid of the garbage, sawdust, and clutter to prevent opportunities for nesting. 2. Rodenticides. Contrary to popular belief, rat poison is allowed for use in poultry farms and recommended as an effective method of controlling rodents by Mississippi State University biologists. However, please, exercise extreme caution to prevent accidental and secondary livestock poisoning. There are no pet-safe poisons, as all of poison baits are created to kill rodents. Be very careful: rodenticide poisoning may occur when your pet swallows such bait. In order your cats or dogs do not eat it in the yard by chance, you may string it up with a strong wire between a couple of fences, for example, or hide pieces of bait in landscape rocks or other places where pets can't get – and then wait for dead rats. “Just use it carefully in garages and attics -- places where your kids and pets aren't going to find it and sample it. It's possible that a dying rat or mouse will exit and be eaten by another animal (though if you live in an urban area, the chance is low compared to a rural location) -- but my experience is that most will die near the location where you used this. Not a pleasant smell for a few days (which is why I won't use in an attic, only in a garage or storage building, where I don't have to contend with the odor)”. Yes, poisons kill rodents. But you don't know what place to die they will choose. Dying rodents are looking for a place to die, and you are lucky if they go away. But perhaps it will happen in your home or backyard, then you will find a nasty surprise - dead rat smell. (If it bothers you, read “How to get rid of dead rat smell”). Can I use the rat poison bait inside a house? How to do this best? Yes, Havoc Rat & Mice bait can be used indoors. You may either scatter the granules around, or just open the packet and place it where the rats are likely to run. There are mice in my attic. Shall I leave the bait in there? It is rather difficult for me to get into the attic, so I am afraid that the smell of dead mice will trouble my family afterwards. The chief advantage of this bait action is that after being eaten by mice or rats it causes great dehydration in their bodies and they are eager to find the source of water or die. As a rule, they manage to leave the house – but if not, you won’t notice any strong smell. So you can leave the bait in the attic. How long is the shelf life of the product? You need not be worried about this: Havoc bait may be kept as long as 4 or 5 years and this period will not impact its efficiency as the packets are sealed safely. Does Havoc Bait work on rats and mice with the same effect? Yes, in practice the bait attracts and kills both mice and rats. NB! You must know that rats and mice are very canny creatures, so if they see that one died from this bait they can reject eating it. So if you see that rats or mice don’t eat it, change the bait. What Is The Best Rat and Mouse Bait for Traps? There are a lot of options to choose from, and you should also know how to lure the pests in effectively. For the rat trap, you should choose the best bait that will work effectively on rodents in your region. This is a necessary step, because if the bait does not attract rats, they will never go for it and you'll be left with an empty rat trap and persistent problem. Have you heard about the great rat eradication? It's an example of large campaign which directed to getting rid of rats in huge numbers. We hope that there are people amongst you who just have a small rat infestation – you can use organic baits for rat traps in order to eliminate some rats. Peanut butter: It's actually more effective than cheese, as we see in cartoons. Rats are very attracted to peanut butter. Chocolate: Sweet chocolate definitely entices rats to come out of their places of rest and try to get some candy. Bread: Plain bread or bread with a little butter on it is very effective for baiting rats. String: A string is a nesting material attracts rats significantly. They use it to make their nests and keep warm. This will be an incentive to come to the rat bait. Cotton: Cotton is another nesting material that can be used to attract rats. Why did d con stop making the mice and rat poison pellets? That stuff was the best on earth! Does d-Con have an expiration date? How much will it be effective? I did not find this information on the package. But I bought a lot of packages, and used them for several years, and the bait worked! I have a camp in the mountains and mice do get in. I've used the d-con bait trays and boxes with the granules. As it turns out the trays and boxes were cleaned out within a couple of days and I found the granules stored all over the camp. In boxes, between the sheets in the bunk beds and various other places that were out of the way (where they hide). This was not acceptable for me so I use traps. That way I know I got them. I've had great success with Tom Cat mouse traps baited with their liquid bait that comes in a small squeeze plastic bottle. It costs about $5 but it works great. Seem they can't resist it. It works a lot better than peanut butter. It's an on going battle but seems I'm winning. Thumbs up to the previous poster regarding the de con rat poison. We used it in our country house. Naturally, there were some rodents there and we started considering ways to remove them. We opted for poison and de con caught our attention. I won’t rant as there is enough information about this poison; all I am going to say is that we loved the result. I truly recommend it. And what about decon rat poison? Do you know anything about it? I can say that this poison is quite old and it has long been on the market. When it comes to its effectiveness, it is just as helpful as such market leaders as havoc. I personally used decon when I had rodents in my pantry. We stored wheat there and successfully got rid of the pests with the help of this poison. I think it’s an excellent rat killer. Which mouse bait is the most effective? I heard that sunflower seeds can be used, is that true? Again, there are two types of bait: non-toxic and obviously, toxic. I believe that tomcat is the best mouse bait of them. It’s my personal opinion but I formed it after reading many reviews and threads and dashboards. I would also like to emphasize havoc bait which is one of the market leaders as well. How does mice poison act? As far as I know, there are two types of poison: slow-acting and fast-acting once. In general poisons affect a rodent’s nervous system once ingested, then they paralyze the animal and it dies. Simple way I kill Rats is I mix equal parts of plaster of Paris & flour mix well add a very small amount of cooking oil this attracts rats. Leave in a small plastic bag close to where you have seen Rats or rat Poo. When they eat this simple mixture it sets solid inside the rat it will die with in minutes of eating this tasty last meal & no poison in the dead rat to harm any other animal that may eat it. so if rats eat some poison, they live outside under our deck, barn and sheds. Mostly tree rats as I can see, if they eat the poison and die and our dogs find the dead ones how likely will it be for the dogs to get sick or even die? We have a mouse problem and I have no problem with poison bait. Those who insist people use humane methods either A) They dont have a mouse problem. Or B) They have yet to discover how expensive and totally ineffective they are. We bought 3 different 'live traps', two of them were too short and their tails held the trap door open so the little critters ate the peanut butter and made a U turn. The other trap they wouldn't even enter, so my advice to anyone going through this sleepless (Because they are very active at night, as you toss and turn wondering what the little savages are gnawing through.) save your money and just GET THE POISON ! Gary, what poison did you buy to get rid of your mice? I really need to try this stuff but I am very afraid to. I have a chi mix that is a mouse killing machine if he sees a mouse.. but he also eats the mice. I try to get him to stop eating them as they carry disease some times but he runs and tears it apart and eats it so fast I cannot stop him.I sure do not want him to get a mouse that has been poisoned. I think he likes mice meat better than dog or people food and the thrill of the hunt is very appealing to him also. I just don't know what to do but one thing is for sure, I have to get rid of the mice without killing my 11 year old chi. Beware!!! kills the hawks and owls that eat the sick or dead mice and the creatures that eat the dead birds or mice, including cats, raccoon, fox. By killing the hawks and owls etc... we are killing the rodents natural predators that also die as slow, gruesome death. CJ... your statement is without warrant and not true with most poisons. After ingestion of the poison it is broke down and rendered safe. Plus the fact only a small amount enough to kill the rodent is on board. This total nonsense, sorry. It is dangerous to ALL creatures that eat rodents. Period. The only exception is Zinc phosphide. Any rat or mouse poison can kill a cat , dog, or wildlife, there is no safe amount to ingest without possible harm to an animal, especially one that dehydrates as severely as this product does. The precautions alone for usage is enough to scare some one from using the product, even if you pick up this product without gloves, it can deliver the poison through the skin of a human.This product can last a long time , just because the mouse or rat is dead , does not mean the poison is no longer effective in the dead mouse. C.J. Are you referring to once particular rat poison brand or all of them. We have a rat problem but don't want to harm wildlife. I live in my own house and I cannot say that I have big problem with rat. But sometimes I see 2-3 rats and, surely, it is not normal. I bought here JT Eaton 709-PN Bait Block to stop rats in my house and to prevent appearing of new one. But I am afraid about my cat - Is it die, if it will eat this block?